I have for sale one of the multilame gorgets we used to make and since I scored a small piece of brass at a garage sale this weekend, two pairs of spaulders with brass trim. 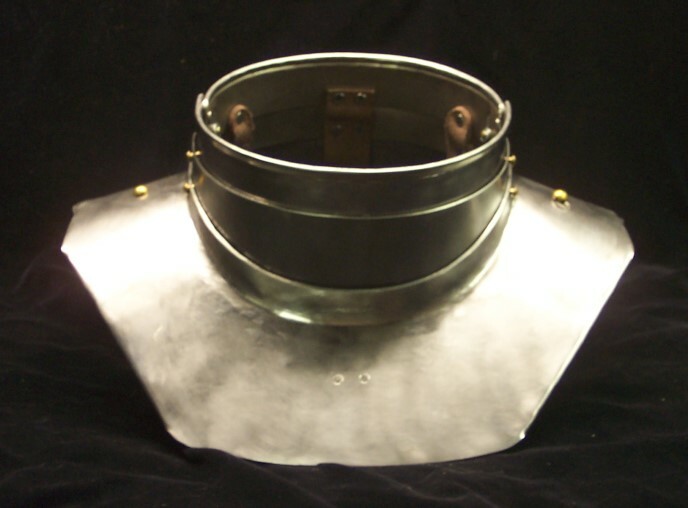 The gorget is one of the 15/16th century gorgets we used to make. 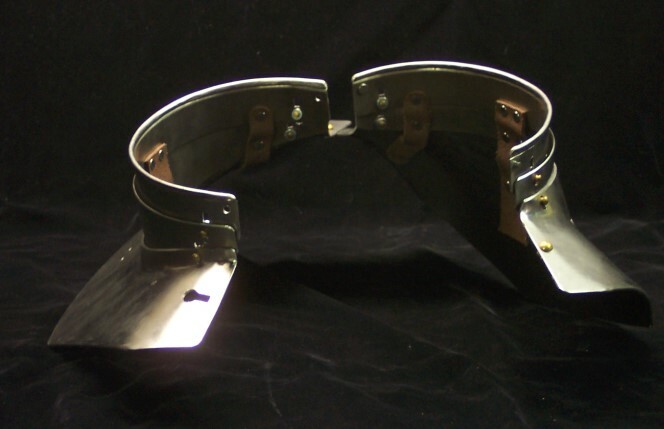 Made from 16 gauge CR mild steel with beveled plate edges and rolled edges where appropriate. Closes with a keyslot rivet and pin closures on either side of the top neck lame. If desired I can install straps for the attachement of shoulder harness. Will fit up to an 18 inch neck with room for the collar of an arming garment or 19 without. I'm thouroughly average at 5 foot 10 inches, 180-185 pounds, not particulally large just average and this fits me fine. Like to get $180 ( less than we used to get for these ) plus the cost of shipping. 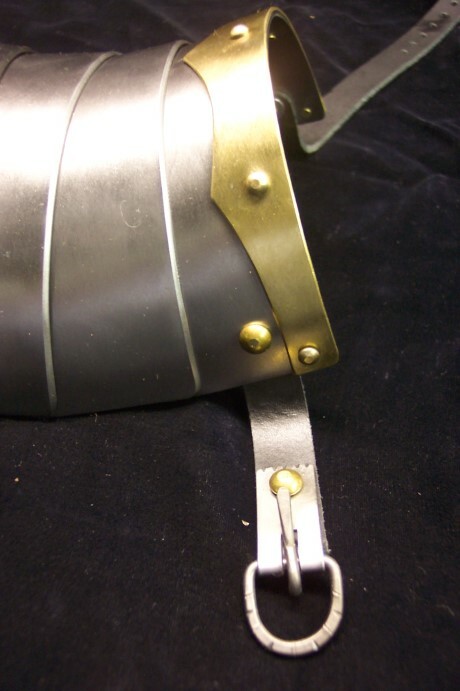 The brass trimmed spaulders are made from 16 gauge CR mild steel with hand rolled and counter sunk edge on the main plate, as well as beveled edges where appropriate and a scalloped brass border on the bottme lame edge. 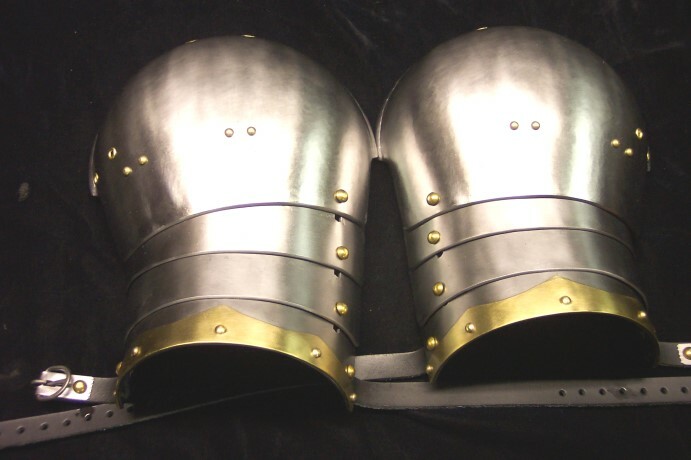 The spaulders articulate on both leathers ( front and center ) and slot riveting ( back ) as per historical examples I used to own. 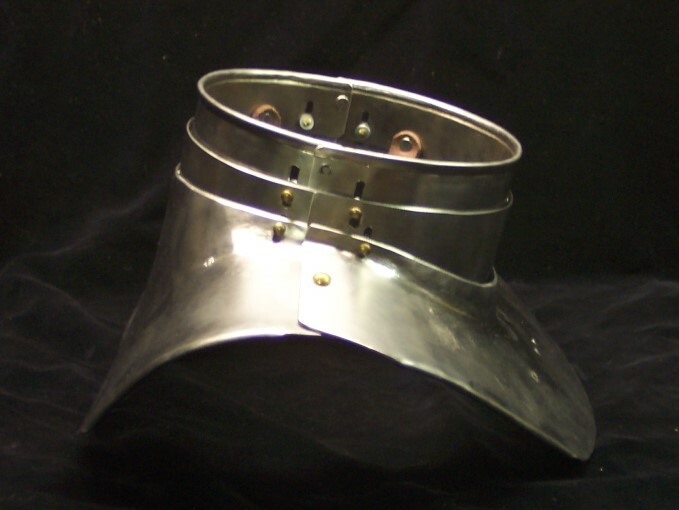 The spaulders have eyelets for pointing but I can install a set of buckles if desired for attachment to a gorget. Includes hand made buckles with steel strap ends with light file and chisel work decoration. I can adjust the curvature for fit but based them on myself with a 14.5 inch biscept and took into account the rebracer for arm harness. Like to get $75 for each set plus shipping.